Fargo. The name conjures up a distinct accent, a dark comedy, a bitter wind chill. Nothing about Fargo says college basketball -- until now. North Dakota State, in its first season as a full member in Division I, begins the Summit League tournament in Sioux Falls, S.D., Saturday against Centenary as the No. 1 seed after winning the conference with a 16-2 record, 23-6 overall. 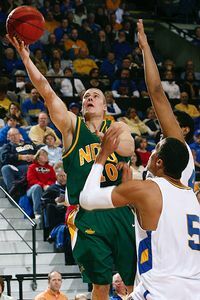 AP Photo/Eric Landwehr Ben Woodside leads North Dakota State in scoring with 23 points per game. "Until now, we were best known for the woodchipper scene in the movie," North Dakota State coach Saul Phillips said of the infamous scene in the Coen Brothers film in which one of the kidnappers, well, gets rid of the other in a woodchipper. "There's a lot more to offer. But we are still waiting for the polar ice cap to retreat here." The Bison are the model for all provisional Division I programs trying to make the jump to full-service Division I. Why? The Bison didn't deviate from their unique way of building the program. North Dakota State has won the fifth most games in NCAA history in its first full season as a Division I member. 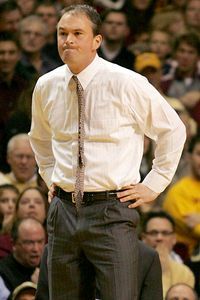 Phillips and former head coach Tim Miles, who is now in his second season as head coach at Colorado State, decided to redshirt then-freshmen Ben Woodside, Brett Winkelman, Lucas Moormann and Mike Nelson with the sole purpose that they would be fifth-year seniors when the Bison were eligible for postseason play. When the players committed, though, the NCAA had required a 13-year waiting period for teams to get eligible as a new Division I member. By the time they started school that was reduced to five years. "To be honest, when I was a [high school] junior, there was no way I was going to go to North Dakota State," said Woodside, a 5-11 senior guard from Albert Lea, Minn. "But as soon as I got up here and saw the university, I made a 180-degree turn. I loved the university and the coaching staff after I left." Woodside said the reason the fifth-year seniors were on board to redshirt was to adapt to the speed of the college game. Woodside said he added 20 pounds during that redshirt season. But sitting out was brutal. "I absolutely hated it," Woodside said. "I was sitting there on the bench, watching my teammates play." Phillips said the Bison were fortunate the administration agreed with the plan. He said it was hard on the coaching staff watching the redshirts consistently beat the starters and know they couldn't play. "Ben had speed, but he couldn't hit a jumper. He used that [redshirt season] to put on pounds and increase his range," Phillips said of Woodside, who is averaging 23 points a game as a senior and put up 60 in a loss to Stephen F. Austin earlier this season. "It was hard, but we had the right group to redshirt." AP Photo/Andy King Saul Phillips has led the Bison to a 23-6 record this year. A year later, when Woodside was a freshman, North Dakota State won at Wisconsin. They knew then, that something was brewing. "That next year we were playing on pride," Woodside said. "We couldn't play in the postseason. Throughout the whole year it was about pride, trying to get the best record we could have. That's what helped us stay motivated during the transition year." What made it even more difficult for the Bison was when the transition started they weren't in a league. Getting into the Summit two years ago gave the Bison an opportunity. North Dakota State finished fourth a year ago but wasn't eligible for the postseason tournament. That's when Miles left for CSU and Phillips, a former Wisconsin assistant, was the natural replacement. Woodside said naming Phillips, who coached the redshirts when they were freshmen, kept the plan and continuity in place. But now the pressure truly arrives. Winning the league and earning a top seed in the conference tournament puts the Bison in position to get an NCAA bid. But North Dakota State still has to win the event to have the plan of redshirting the freshmen come to its ultimate fruition. "This is their only crack it," Phillips said. "I'm trying not to put any more pressure on them. This is new territory. This group hasn't been given anything since they've been here. It hasn't been an easy road." Putting the tournament in nearby Sioux Falls helps with the Bison loyal following. Phillips said roughly 150 fans greeted the team upon arriving back from the final road game at Oral Roberts last Saturday. "There's been a lot of buzz around here," Woodside said. "I think we put basketball on the map at North Dakota State, helped the university, enrollment and all of that." • Pitt's Levance Fields is questionable for Saturday's game against Connecticut. Pitt coach Jamie Dixon said Friday that Fields is still very sore from the fall at the end of the Marquette game. Ashton Gibbs would likely start if Fields can't go against the Huskies. But it is senior day so the coaching staff expects Fields to give it a try. • New Mexico coach Steve Alford said the Lobos should be an NCAA team if they win the Mountain West. The Lobos get a share of the title if they win at Wyoming Saturday. Alford had some interesting comparisons of New Mexico's Pit and Indiana's Assembly Hall, as well as some thoughts on UNLV coach Lon Kruger and his Runnin' Rebels' at-large candidacy on Friday's ESPNU College Basketball podcast. • An emotional Lute Olson was honored at halftime of the Cal-Arizona game Thursday night. The ceremony was well-done and tasteful by the Wildcat administration. • Cal's Jerome Randle was clutch Thursday night with a deep, deep 3-pointer to essentially defeat Arizona. The Bears are in the NCAA tournament field. Arizona may need to beat Stanford. • Nice job showing up by Arizona State in a home loss to Stanford. The Sun Devils' seed is plummeting. • Illinois' defense was a sieve when it came to stopping Penn State's Talor Battle's drive to the hoop with under a second left to beat the Illini. Great scene after the buzzer, but, please folks, let the home players get out alive. Battle looked scared as he was getting swallowed up by the white-shirted, enthusiastic Happy Valley throng. • The Big Sky should just change its name to the Little Sky. For the second straight season, the player of the year is no taller than 5-foot-6. Kellen McCoy of Weber State was named the league MVP. A season ago, Portland State's 5-6 Jeremiah Dominguez was the MVP. • Watched UCLA on Thursday and it's clear that the Bruins shouldn't be counted out as a potential Final Four team. The three seniors, Darren Collison, Josh Shipp and Alfred Aboya, have the experience of three Final Fours to help win close games. Shipp is playing the best basketball of his career, and if the Bruins can defend they can win. Aboya's parents came from Cameroon for the weekend games. It was their first time seeing Aboya play basketball or, for that matter, watching a basketball game.